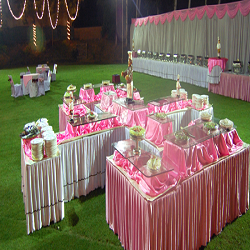 Shree R catering provide weeding catering service. We are provide testi and healthy food. Pure items. Special. Jain rajasthani. Catering along with different themes depending on requirements. Atithya caterer is committed to serve the best service to the guests with delicious food and drinks. Feel free to do an inquiry for your event with atithya caterer. 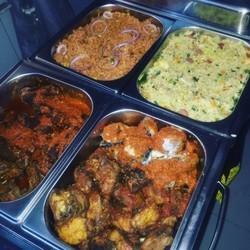 Somani Caterers specializes in wedding receptions catering. From providing cocktail snacks, starters , an evening meal, and desserts. we take care of any other service, which is required to make this unique event cherished for the years to come. Special moment and events not comes every day. Celebrate Birthday, Wedding or special event party with your family members and your special ones at beautiful environment of Hotel Scenaria. We will help you to organize memorable events that cater to your every needs. You will get best service and dining experience. Full Gujarati food. We provide most of the items in Gujarati and fresh seasonal items too. Social Catering is one of our many specialties. From boxed lunches and birthdays to ceremonies and collations, we deliver Social Catering with a "Personal Touch". Our smart catering staff guarantee to make any of your celebration parties may it be the themed parties, house parties or birthday parties a grand success in terms of event catering.